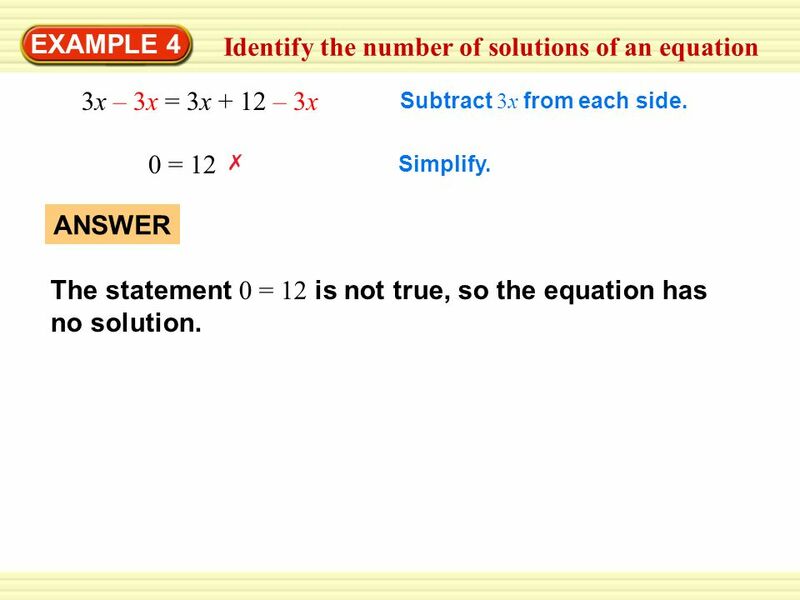 EXAMPLE 4 Identify the number of solutions of an equation Solve the equation, if possible. a. 3x = 3(x + 4) b. 2x + 10 = 2(x + 5) SOLUTION a. 3x = 3(x + 4) Original equation 3x = 3x + 12 Distributive property The equation 3x = 3x + 12 is not true because the number 3x cannot be equal to 12 more than itself. So, the equation has no solution. This can be demonstrated by continuing to solve the equation. 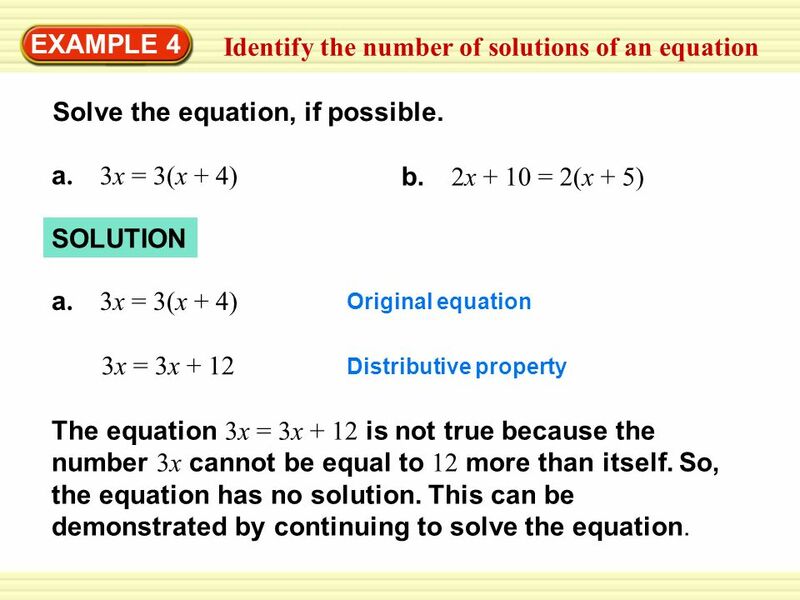 EXAMPLE 4 Identify the number of solutions of an equation 3x – 3x = 3x + 12 – 3x Subtract 3x from each side. 0 = 12 Simplify. ANSWER The statement 0 = 12 is not true, so the equation has no solution. EXAMPLE 1 EXAMPLE 4 Identify the number of solutions of an equation b. 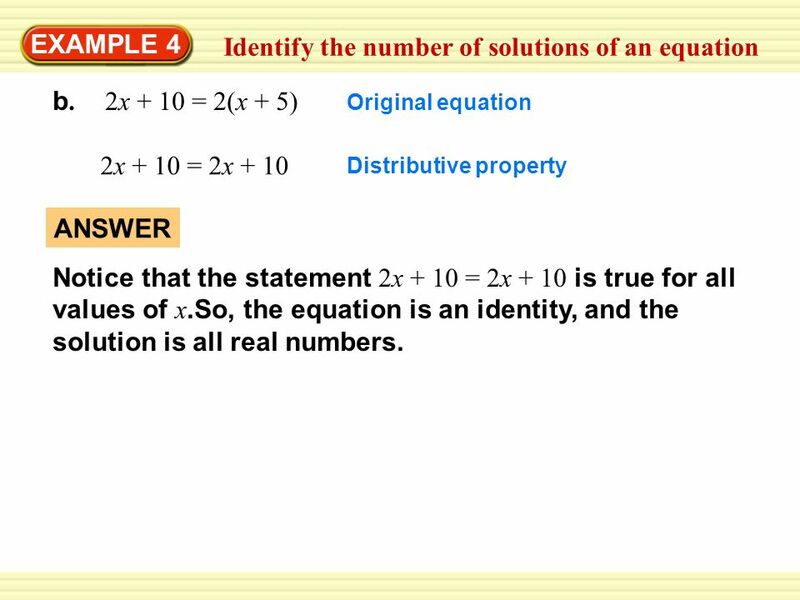 2x + 10 = 2(x + 5) Original equation 2x + 10 = 2x + 10 Distributive property ANSWER Notice that the statement 2x + 10 = 2x + 10 is true for all values of x.So, the equation is an identity, and the solution is all real numbers. 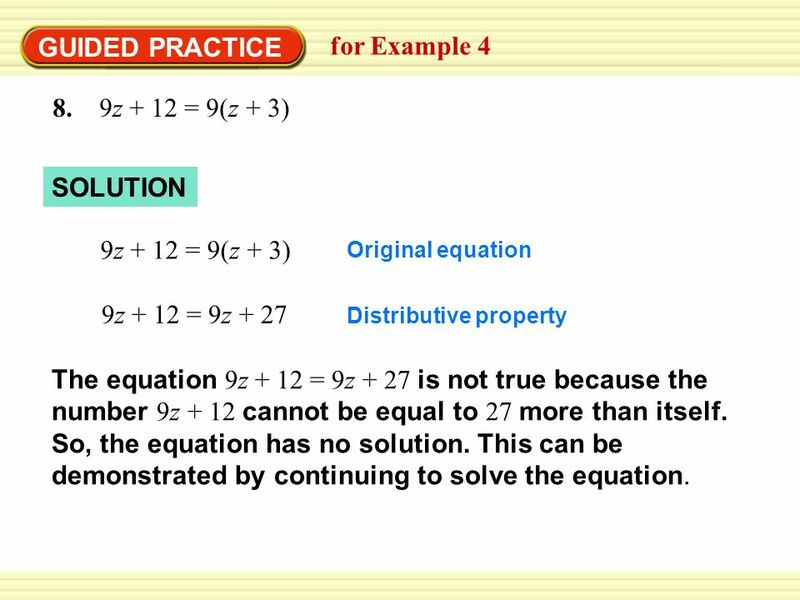 Original equation 9z + 12 = 9z + 27 Distributive property The equation 9z + 12 = 9z + 27 is not true because the number 9z + 12 cannot be equal to 27 more than itself. So, the equation has no solution. This can be demonstrated by continuing to solve the equation. 5 The statement 12 = 27 is not true, so the equation has no solution. GUIDED PRACTICE for Example 4 9z – 9z + 12 = 9z – 9z + 27 Subtract 9z from each side. 12 = 27 Simplify. 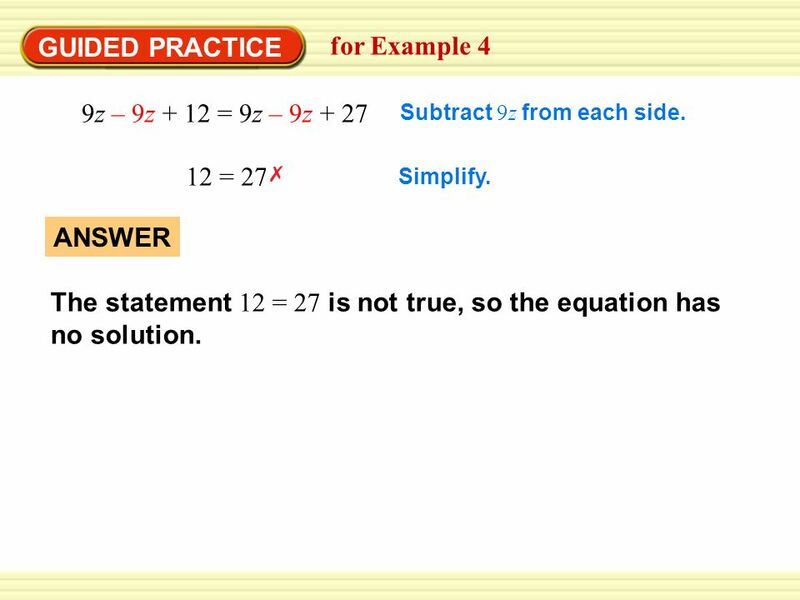 ANSWER The statement 12 = 27 is not true, so the equation has no solution. Original equation 6a + 6 = 6a + 6 Distributive property ANSWER The statement 6a + 6 = 6a + 6 is true for all values of a. So, the equation is an identity, and the solution is all real numbers. 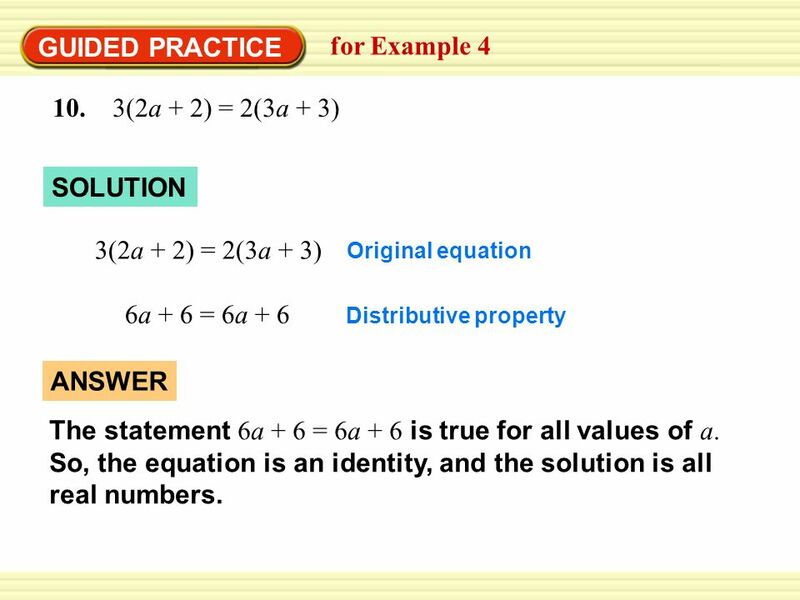 Download ppt "Identify the number of solutions of an equation"
Graphing Inequalities EXAMPLE 1 InequalityGraphVerbal Phrase a. y < 7 b. q  3 c. x > –5 d. h  All numbers less than 7 All numbers less than or. Example 1 Solve ax b c for x. Then use the solution to solve Solve a literal equation + = += 2x SOLUTION STEP 1 Solve ax b c for x. += ax b c Write. EXAMPLE 4 Solve proportions SOLUTION a x 16 = Multiply. Divide each side by 10. a x 16 = = 10 x5 16 = 10 x80 = x8 Write original proportion. Bkevil Solve Equations With Variables on Both Sides. EXAMPLE 1 Solve a quadratic equation having two solutions Solve x 2 – 2x = 3 by graphing. STEP 1 Write the equation in standard form. Write original equation. Solve an equation using subtraction EXAMPLE 1 Solve x + 7 = 4. x + 7 = 4x + 7 = 4 Write original equation. x + 7 – 7 = 4 – 7 Use subtraction property of. Step 1: Simplify Both Sides, if possible Distribute Combine like terms Step 2: Move the variable to one side Add or Subtract Like Term Step 3: Solve for. EXAMPLE 1 Collecting Like Terms x + 2 = 3x x + 2 –x = 3x – x 2 = 2x 1 = x Original equation Subtract x from each side. Divide both sides by x2x. 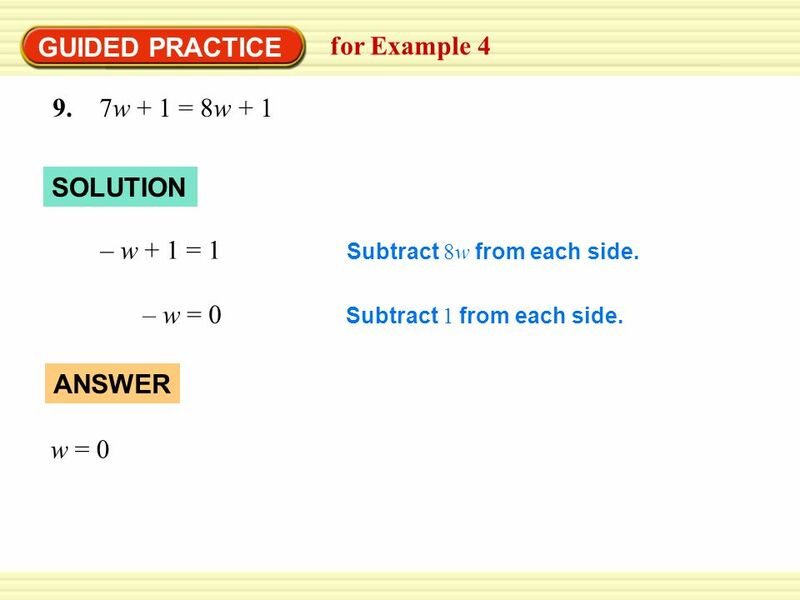 2.4 Equations with Variables on Both Sides To solve an equation with variables on both sides, you must use the Addition or Subtraction Properties of Equality.